With over 150 years of proven industry innovation, Mahr Metering Systems has been a leading supplier of durable meter mix solutions across multiple applications. Mahr Metering Systems has a proven track record providing meter mix solutions for multiple applications in aerospace and aviation, automobiles, extrusion, medical equipment, personal care products, pharmaceutical and medical manufacturing, and textile manufacturing. Our machines can perform in any environment from general purpose to Class 1, Div 1, as well as virtually any material from food grade to liquids and powders. With unmatched versatility, both our standard machines and customized solutions combine state-of-the-art technology with German-engineering designed to last. Mahr Metering Systems has two products designed for filling applications. 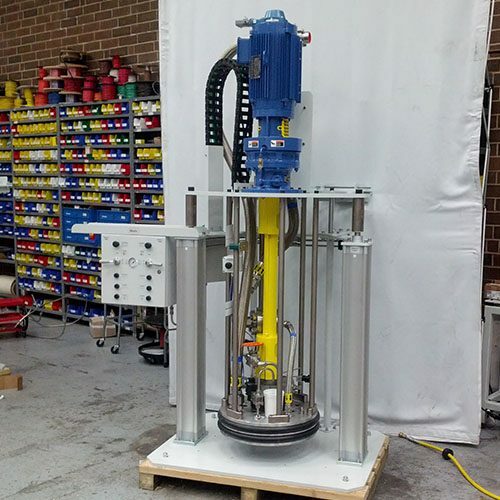 Our MarDrum is a drum pump system developed by Mahr especially for low and medium viscous liquids. It is used for refilling automatically the buffer tanks of our meter/mix-machine MarMax. 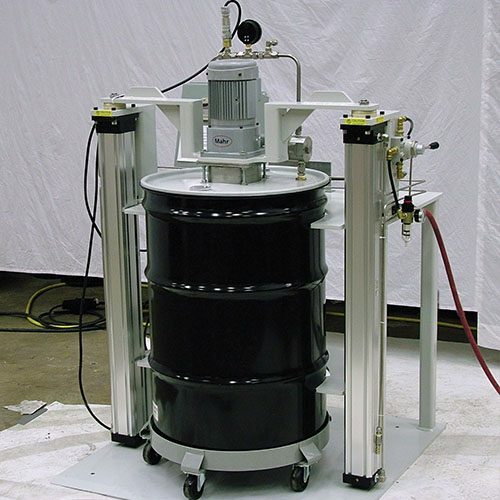 Due to the pneumatic liftstand and the use of dollies a drum change is very easy and almost no contamination occurs. While our MarDrum 200 hv is available for emptying 200 l drums filled with high viscous liquids. A platen, optionally heated, is pushed onto the surface of the liquid and a gear pump can consequently meter the product. Our innovative Mahr Metering Systems constantly develop new solutions and standardized orders to fulfill this application’s growing requirements. 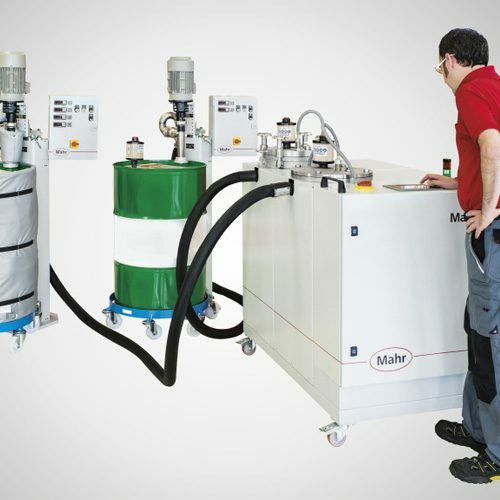 Mahr gear pumps and meter mix machines are part of the production process for composite parts, including: spinning of polyacrylonitrile fiber as precursor for carbon fibers, impregnation of fabrics, impregnation of frovings, and pultrusion of profiles. Our Marmax Meter Mix machines are available for RTM, T-RTM, Pultrusion, RIM, Filament Winding, Rotational Molding, and SMC. Mahr’s Inline gear metering pumps are used in extrusion processing and have single stream pumps mounted in-line with the tubes. 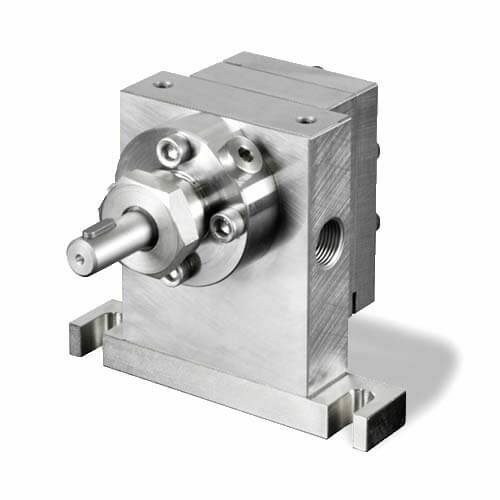 Our inline gear metering pumps have options for high wear-resistance, larger flow rates, combination of resistance to wear and corrosion, and use for chemically aggressive media. 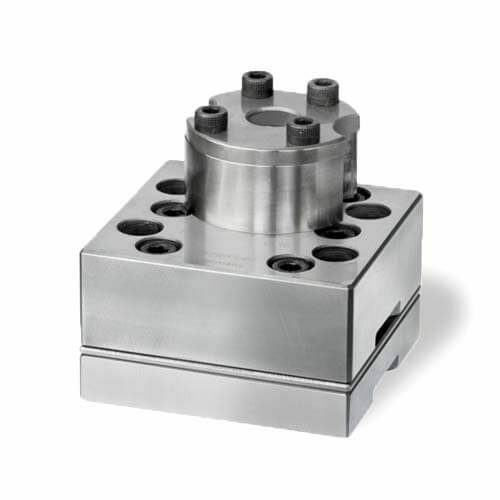 Because of the in-line mounting no additional pump block is necessary and various coating technologies enlarge the application possibilities of the used base materials. Furthermore, a coating reduces friction, wear and corrosion. Wherever precise mixing and dosing is required, the standard series of MarMax meter mix dispensing machine is typically used. Common applications of the MarMax meter mix equipment include single- and multi-component adhesives and resins, thermosets, thermoplastics, polyurethane, plastics, adhesives, chemicals, composites, and converting. Our MarFin Spin Finish Gear Metering Pumps are also extremely precise, especially for fast spinning processes that allows for better properties for further processing and an exact metering of the finish for each product stream is assured. In general, each of the products can be used for dosing liquids however, the operating conditions limit the selection. For use in Spin Finish Processing, Mahr recommends the MarFin Spin Finish Pumps for extreme precision, especially for use in liquids like antistatic finish and adhesive additives or other additives. The Mahr MarFin Spin Finish Pump can avoid fiber breaks or electrostatic charging that allow fibres to get a better elasticity, as well as better properties for the further processing. 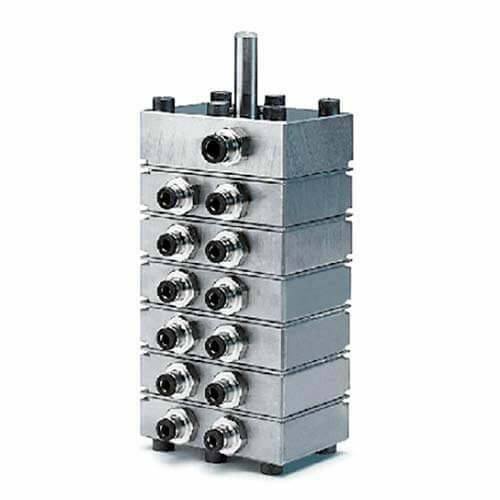 An exact metering of the finish for each product stream is assured and are applicable in a variety of applications in different industries to meter.